Will Howard Schultz Create A Viable Third Party In 2020? It is long past time for our country to have a new political party that challenges the Bipartisan Washington consensus and duopoly which has dominated American politics for decades. Donald Trump actually achieved the goal of disrupting the two main parties in 2016 but then quickly morphed into just another establishment candidate willing to implement US globalist foreign policy as we are seeing so crudely in Venezuela today. Now comes another billionaire posturing to convert his business acumen into political success, this time as an Independent. as an outsider to the chagrin of the Bush Dynasty, William Kristol and other never-Trumpsters. be made that Bernie did, too, except for the shenanigans of Debbie Wasserman Schultz, Hillary Clinton and the DNC. be around next year to contest the election. wars he will complete my vision of a new pro-peace party bridging Left and Right on a narrow agenda that can win in 2020. Afghanistan. The problem for the incumbent is his top policy advisers have not gotten the message and are creating cognitive dissonance with their inconsistent actions in Venezuela, Syria, Iran and elsewhere. Schultz apparently has none of the baggage that Trump brought to his campaign and administration, either by way of an acerbic personality or shady business dealings. 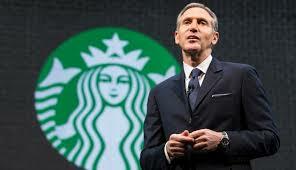 Perhaps we will learn things about him over the coming months that reveal he has sinned in some manner overthe years whether by way of a sexual dalliance or even has a less than perfect tenure as CEO of Starbucks. Of course, the candidate must be thoroughly vetted including close examination of his alleged “active Zionism” to see if that or anything else disqualifies him from seeking the highest office in the land. But it is unlikely he will be carrying the weight of endless scandals we know Hillary and Bill Clinton brought to the table nor any of the funny money links Trump has to the Russia Jewish Mafia that helps fuel the dubious Mueller investigation. The country is desperate for new leadership, free of the incivility, corruption and ugly polarization we have seen in recent years that exploded in 2016 with the Trump/Hillary pairing and continues on into the present tense with Hillary being replaced by Pelosi, Mueller and those suffering Trump Derangement Syndrome. a new party a short time after it was created? Perhaps. wisdom is embedded in my 2016 proposal to create the American Populist Party. For it is populism on the Left (Occupy Wall Street/Sanders) and the Right (Tea Party/Trump/Ron Paul) that has gone to the core of the deep unrest pulsating at the heart of the American people. Trump tapped into that malaise and then sabotaged his success through petulance, arrogance, ignorance and poor judgement, especially in the selection of his top appointees such as Jeff Sessions, Nikki Haley, John Bolton, Mike Pompeo and now Bill Barr to be the new Attorney General. If Schultz can show the courage and wisdom to move ahead boldly as an Independent (3rd party) candidate, he has the potential to build on what Trump accomplished with his wrecking ball ways and lay the foundation for a far more viable future for what’s left of our Republic. Truth and Reconciliation can replace acrimony, restore civility and empower America to be Great…………perhaps for the first time.